One of the key tasks of traders’ daily job is to analyze trends. It is extremely crucial for profitable trading to find answers for such questions as ‘Will the trend continue, and how fast?’; ‘What is the depth of a possible retracement?’; ‘What are potential reversal points?’. Traders spend hours in order to catch a strong trend, using different methods and techniques and trying to identify best entry points. One of the most effective instruments to trade in both trend and sideways range conditions is Bollinger Bands. Multi-functional advantages made this tool so popular among binary options traders. 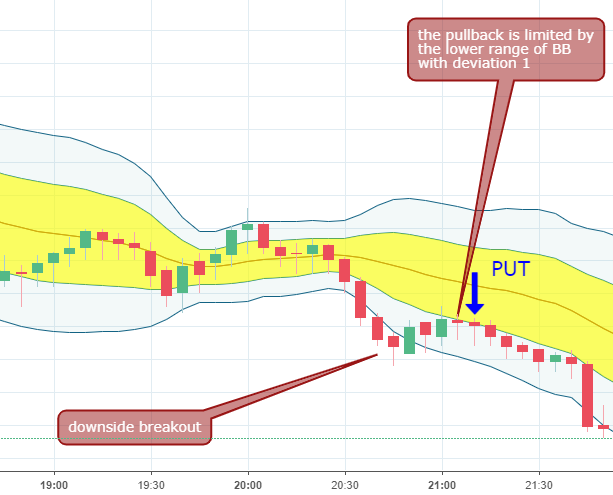 This indicator shows not only a trend’s continuation and reversal, but also it indicates periods of larger volatility which gives a lot of information for an analyst in the decision-making process. However, as many technical lagging indicators, BB has fake signals sometimes and that disadvantage lowers the trading system’s efficiency. 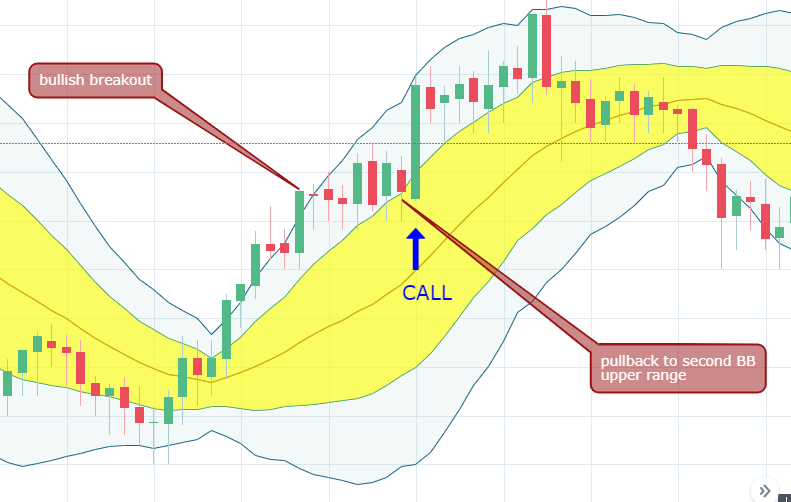 This article will show you several tricks on how to use Double Bolli method in trading practice and how to avoid fake trading alerts, squeezing the blood from the stone and taking maximum information from this instrument. We will use two BB indicators at the same time, changing default settings and having an additional trading signal compared to the standard use of it which is described many times. First of all, we need to choose an asset to trade on and EUR/USD would fit all of the requirements for technical analysis. Secondly, the timeframe choice is also important and 5 minutes chart would be a compromise between super-fast profits and patience. John Bollinger was a smart guy to invent his indicator, however, we would offer some updates here. The default period of the tool is usually equal to 20 candles. Although, we prefer using 21 as the period just because this number is in the Fibonacci row. The standard deviation is traditionally 2 but we will use a combination of two BB indicators with deviations 2 (default) and 1 (shorter). One more useful tip to improve the graphical comprehension is to change colour for the second BB indicator (the shorter one). Although this trading technique could be used in several market conditions, we will take an example of the by-trend strategy, when the price is going in one direction distinctly. The main target of our search is to identify the best entry point when the price pulls back from a recent top, reverses and goes in the same way as before, breaking the previous top/bottom. 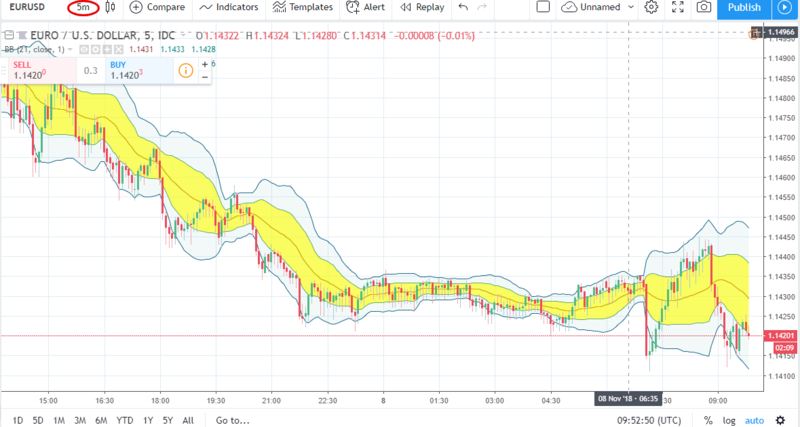 Traditional Bollinger Bands method suggests a pullback to the medium line before entering the market, however, the market is not so kind sometimes and it does not give a trader such a gift. So we will consider an earlier entry just not to miss a sharp price action. ● The price breaks through the upper range of the traditional BB (deviation 2, blue colour). ● A downside pullback occurs and the close price of the candle does not cross the upper line of the second BB range (deviation 1, yellow colour) from above. ● The price breaks through the lower range of the traditional BB (deviation 2, blue colour). ● An upside pullback occurs and the close price of the candle does not cross the lower line of the second BB range (deviation 1, yellow colour) from below. As you can see from the examples above, the method works effectively in periods of a strong trend. Moreover, profitable deals are not restricted with just one candle after the signal occurs. Traders can keep buying options in the same direction several times until the opposite signal would happen. This feature allows traders to have a series of profitable deals in a row. Once you started opening deals, you should switch your attention to the upper/lower range of the standard BB indicator with deviation 2 and monitor the price approaching the extreme line. The one-way action has to be considered as finished when the current price bounces off the higher line for rising price and lower range for declining movement. Finmax offers high payouts, education, analytical materials as well as traders support. Join Finmax community and get instant benefits by registering on our website. Our team will contact you shortly in order to help you in optimizing the trading strategy according to your goals. Start your profitable binary options trader career now! ← Modern trading platforms – who are they really?